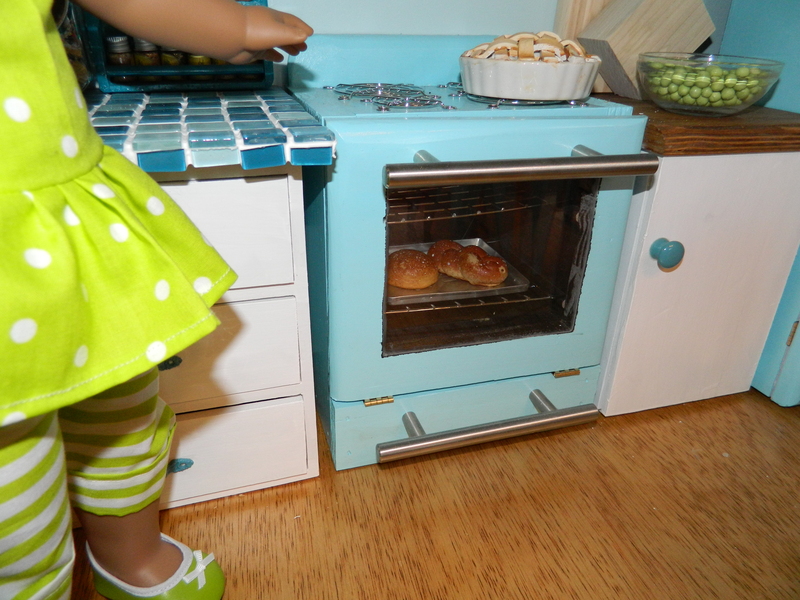 Need that perfect gift for your little doll mommy? 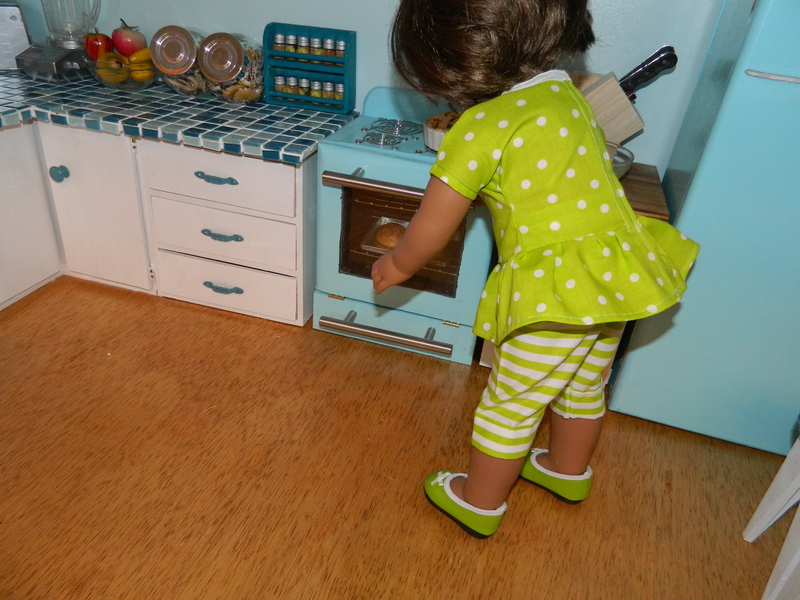 Built for all 18″ dolls including American Girl, Today Girl, Journey Girl, Madame Alexander, My Twinn, Our Generation, KidKraft Sadie, Gotz and Disney Princess and more. 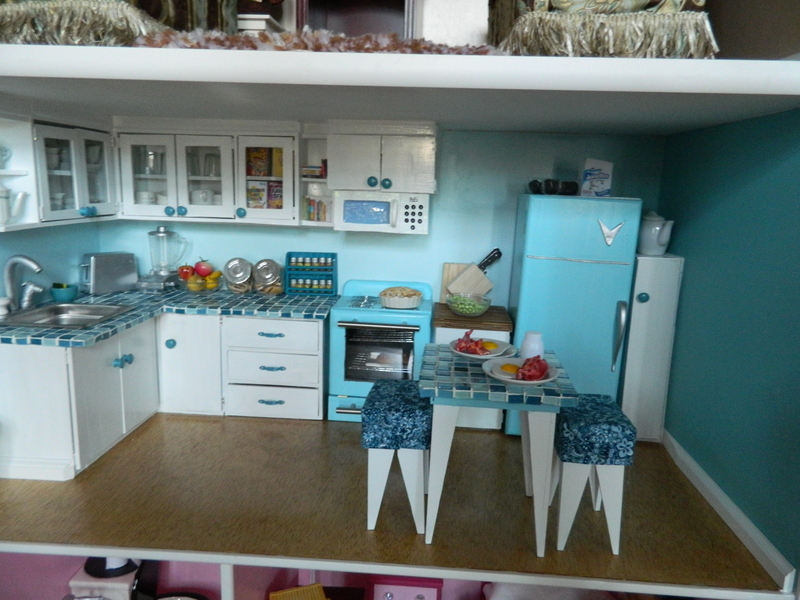 After many months of planning, shopping, designing, building and furnishing, I am offering this one of a kind dollhouse for $3000.00. Designed, built, handcrafted and lovingly assembled for your princess just in time for Christmas. 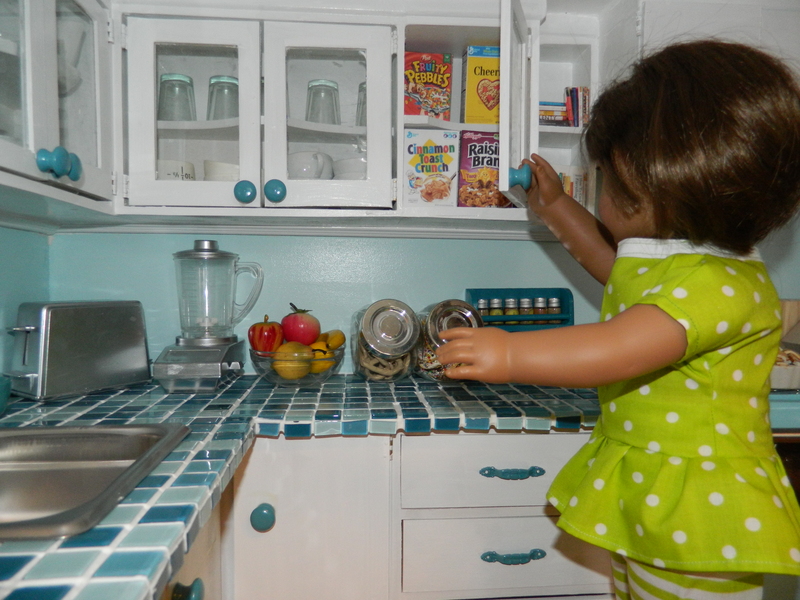 Give your little girl a place to play and store all of her American Girl treasures!! 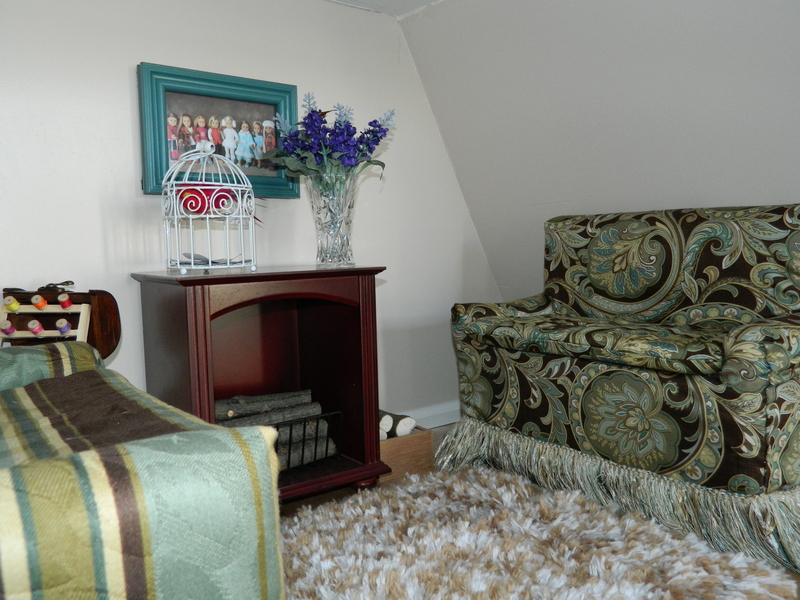 Two pieces, designed for delivery, assembled stands 80″ tall. But that doesn’t include the rooftop garden! Overall dimensions: 80″h x 25″d x 48″w. 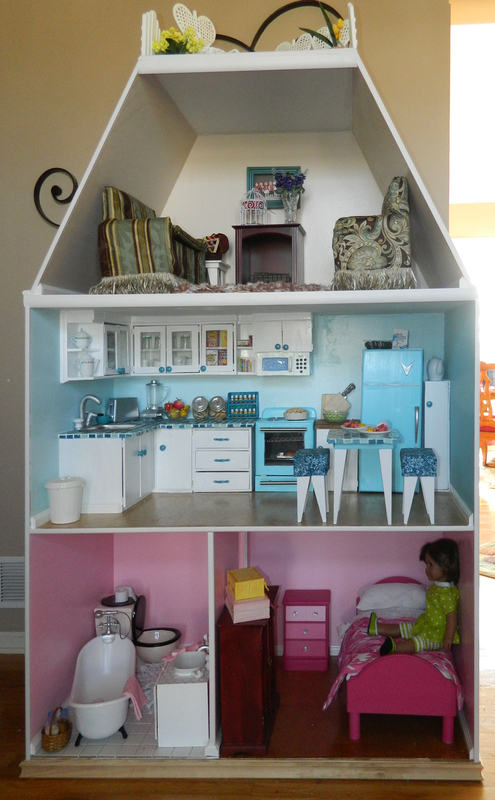 This was hand built by my son and I in our home and has many extras you won’t find in any other house. Three levels boasts a bedroom with adjoining bathroom, living room with fireplace and a state of the art kitchen with built in cabinets and turquoise appliances. Everything pictured is included with the exception of the doll. The doll is not included. 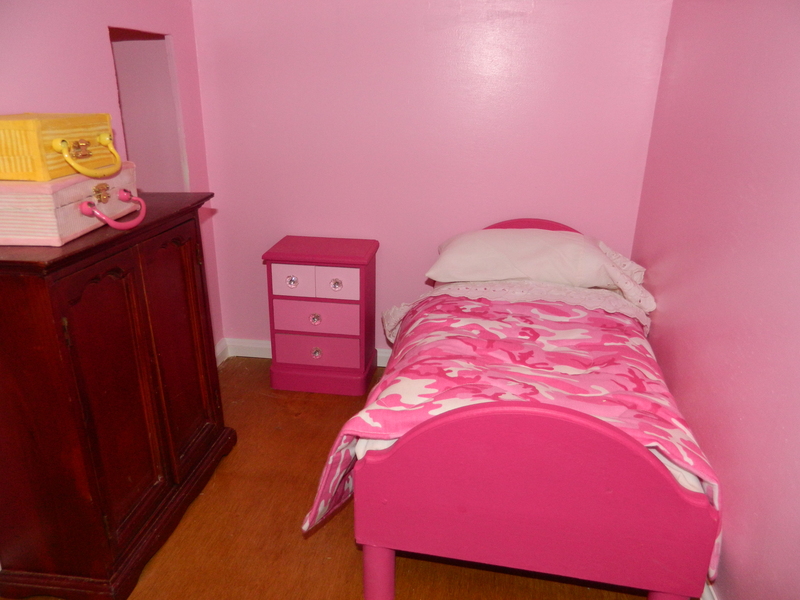 The pink bedroom with handcrafted bed and handmade linens sewn in awesome shades of pink. Includes a pillow with pillow case. 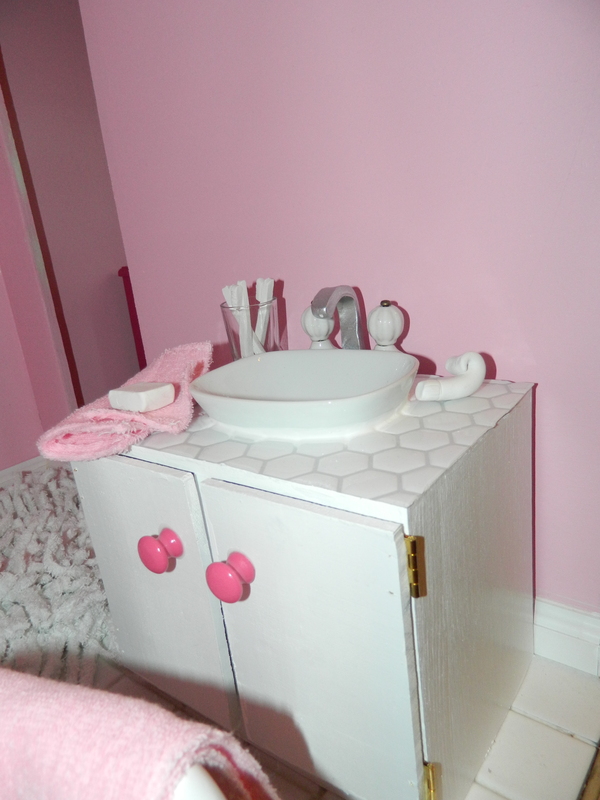 Matching dresser in shades of pink (also called ombré style of painting) with four functional drawers. To round out the bedroom, we have a deep red wood stained armoire with a bar for hanging and three small drawers. 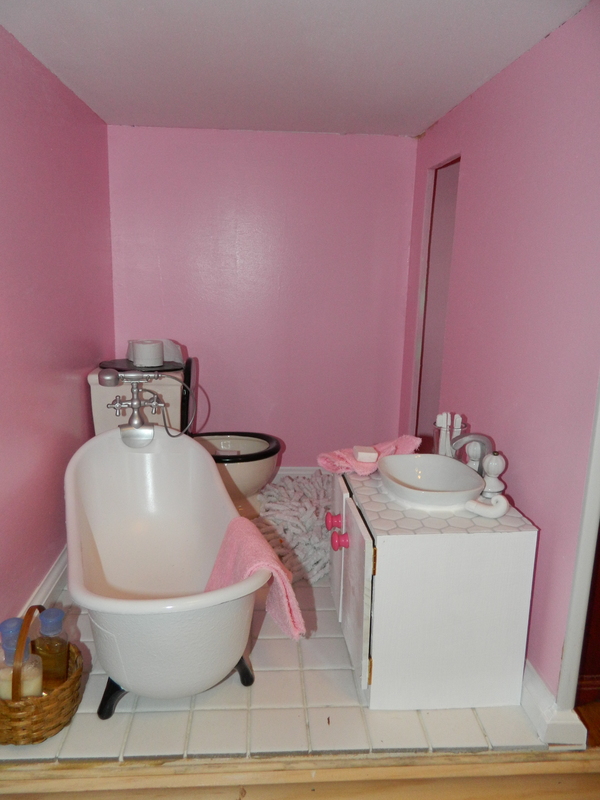 Enter the bathroom through the door in the bedroom to find a clawfoot bathtub, toilet and sink. 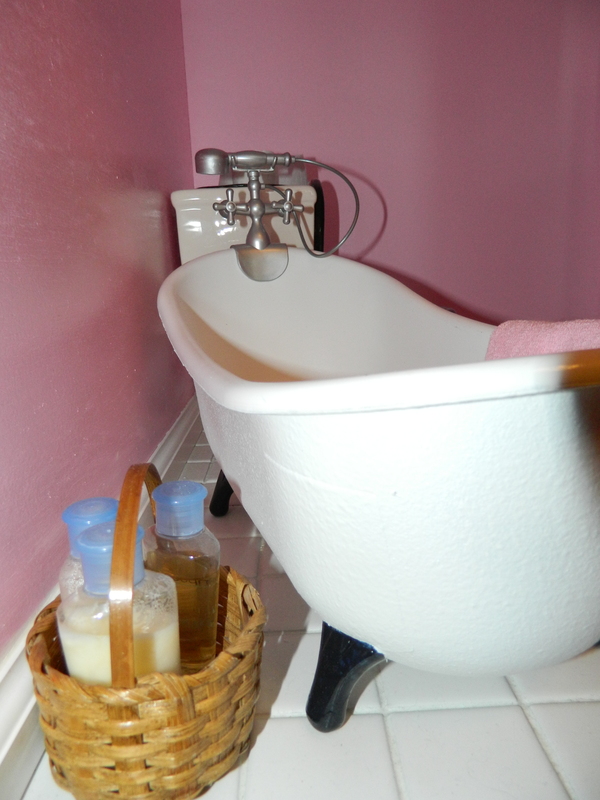 Pink towel set – bath towel, hand towel and washcloth and a small basket with shampoo, conditioner and bath soap. 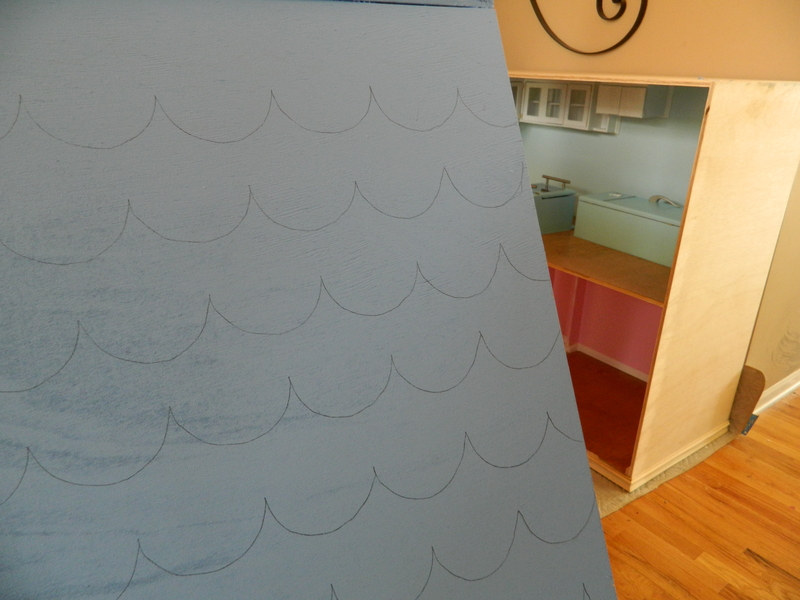 The room is complete with actual white square tiles and baseboards. 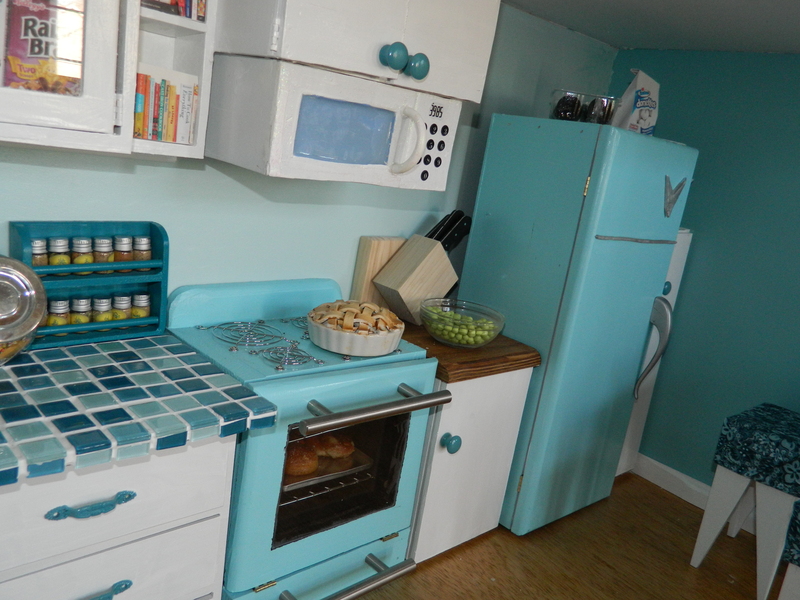 The kitchen is like no other you will ever see! Taking up the entire second floor, it boasts built in glass door cupboards above and below. 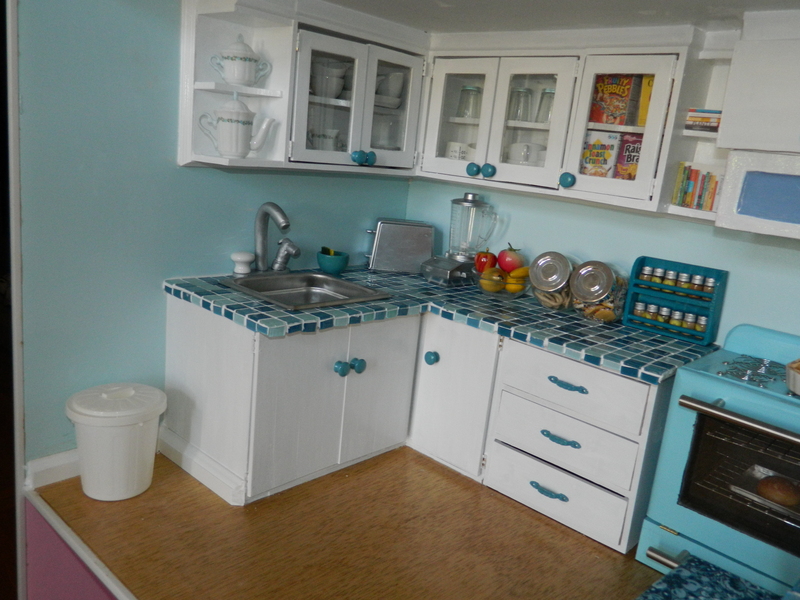 Stainless steel sink with extendable sink sprayer sits on top of a glass tile countertop in beautiful shades of turquoise. The cupboard next to the store has a solid wood surface perfect for chopping vegetables, and houses a mixer and baking pans. 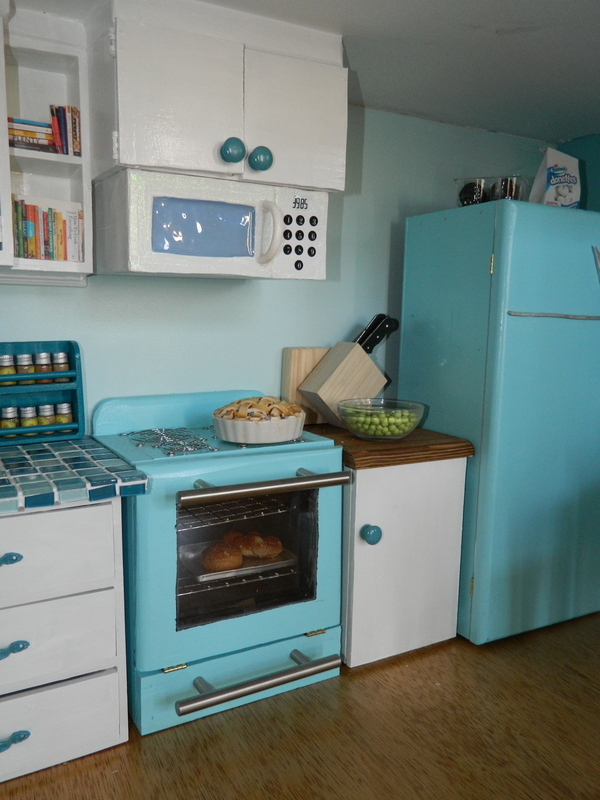 Microwave above the over (sorry, door doesn’t open) but the range has an opening door with two wire shelves and plastic door to see when those pastries are browned. 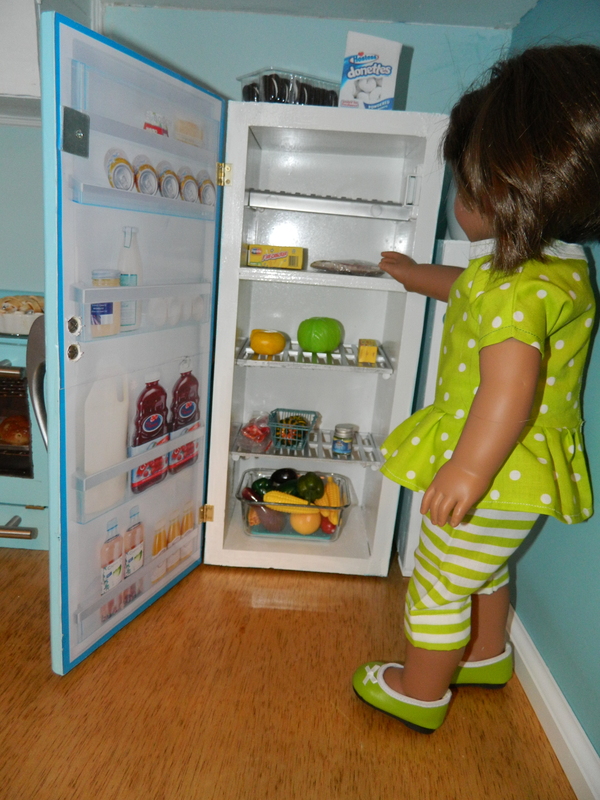 Refrigerator comes stocked with vegetables and food for hosting that perfect holiday party. 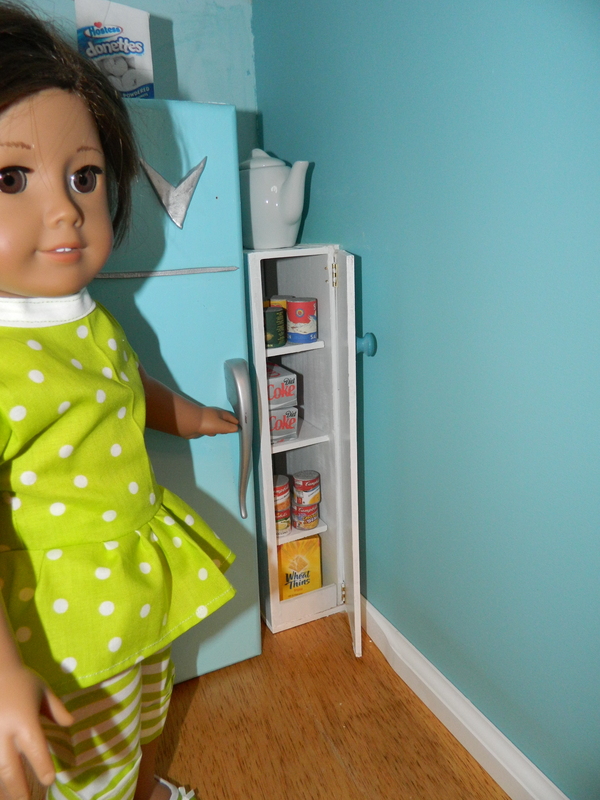 Pantry next to the ‘fridge also boasts soup and assorted canned vegetables. The kitchen floor is a beautiful hardwood floor, three coats of varnish and three coats of polyurethane. This will look beautiful for years of play. 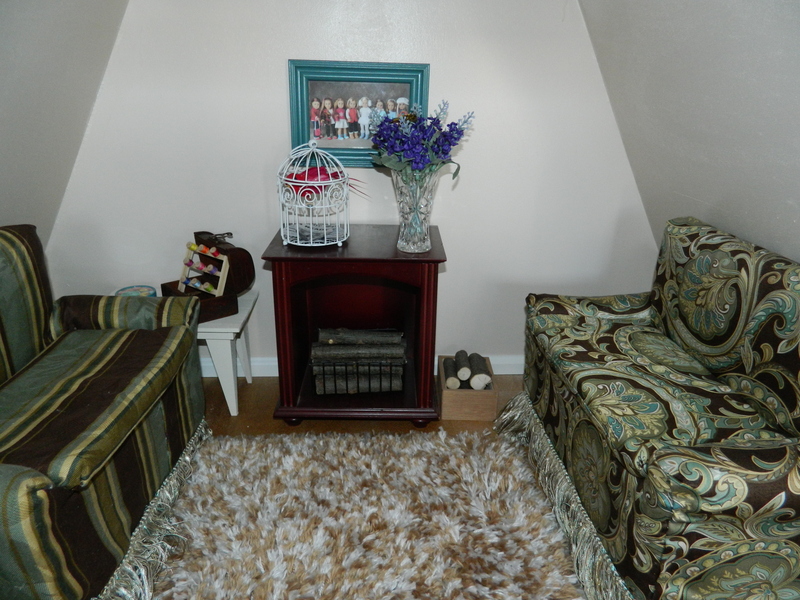 Same floor on the third floor, and has a hand hooked rug in between upholstered sofas. Put your feet up and relax in front of the fireplace (extra firewood in the wood box). 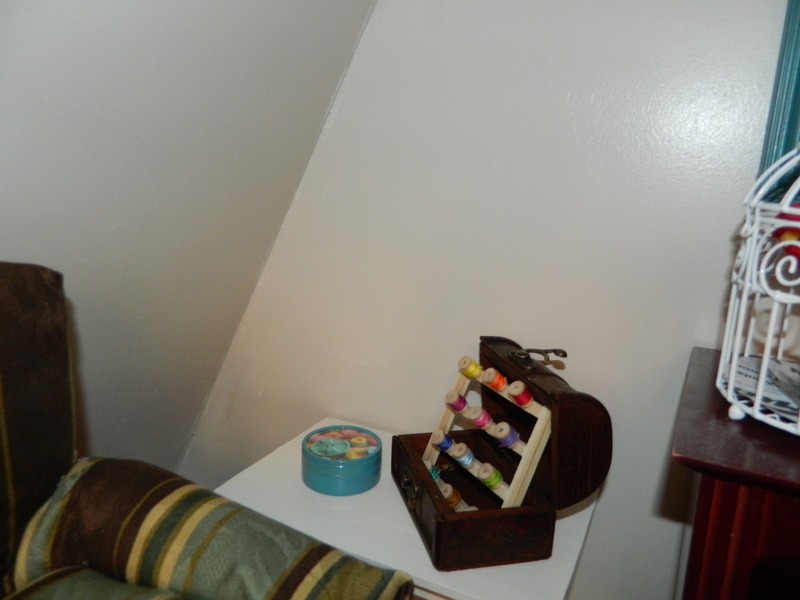 A small table with a sewing box is near for mending socks on a late night. 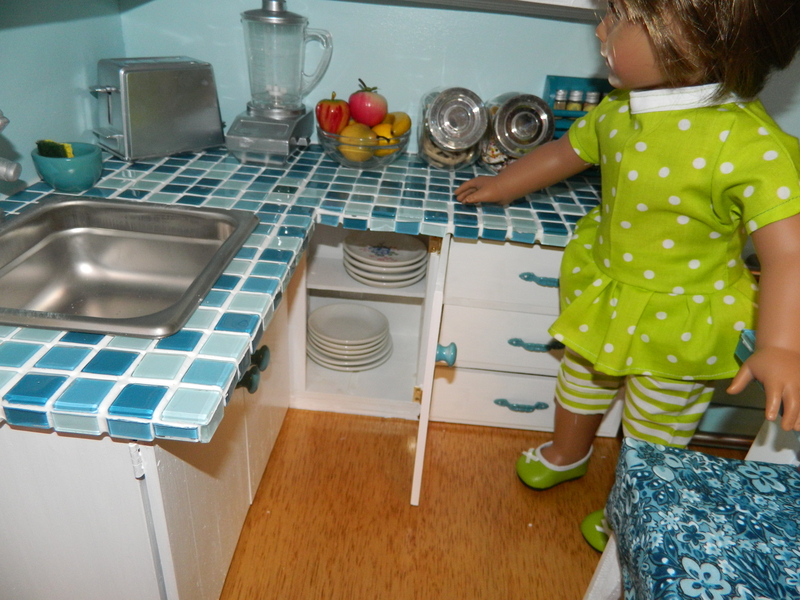 Plenty of room to include a Christmas tree for your dolls! 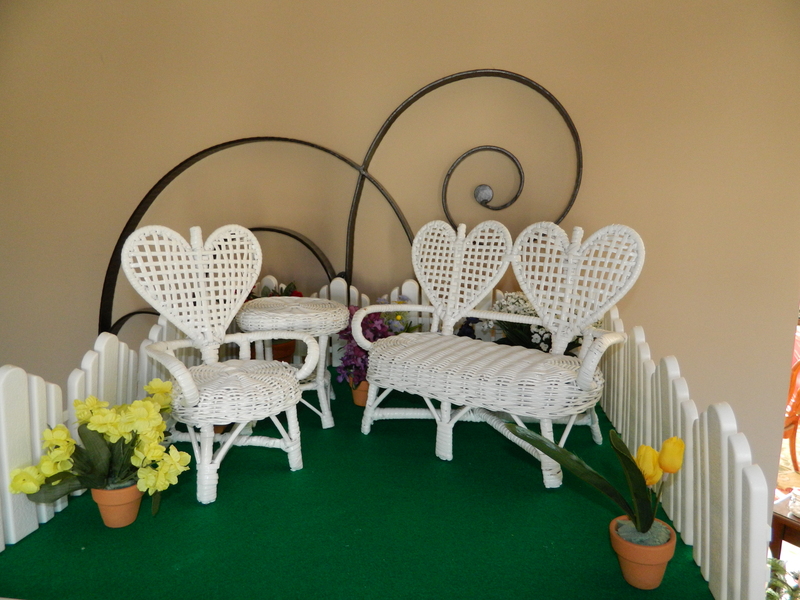 On top, we have one more relaxing space… three piece wicker set with heart motif is surrounded by pots of colorful flowers. A wonderful place to enjoy the sunshine with a glass of tea! Please keep in mind that I am simply someone who likes to tinker and collect, I am not a master carpenter so this is unique albeit not perfect. 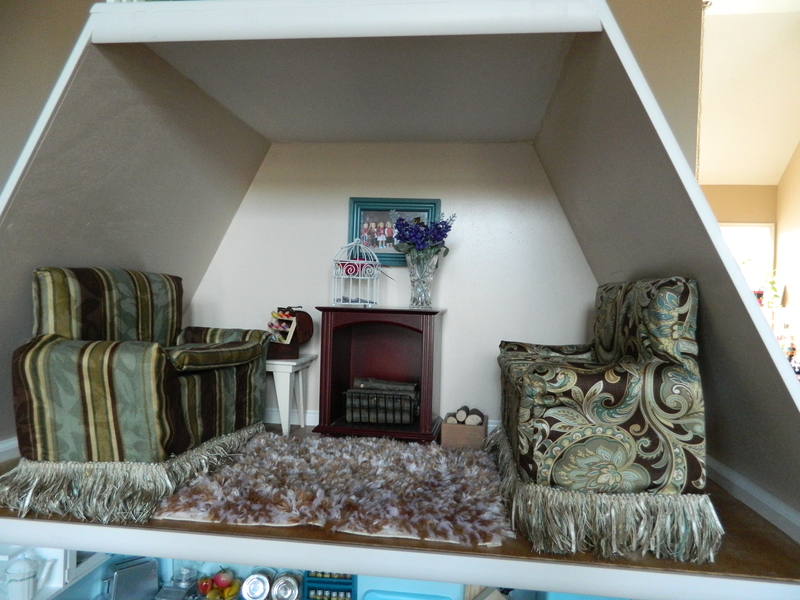 The small imperfections make it a one of a kind but built and furnished with love and laughter! Keep in mind that although lots of little extras have been provided, there is still plenty of room to add your own special touches. 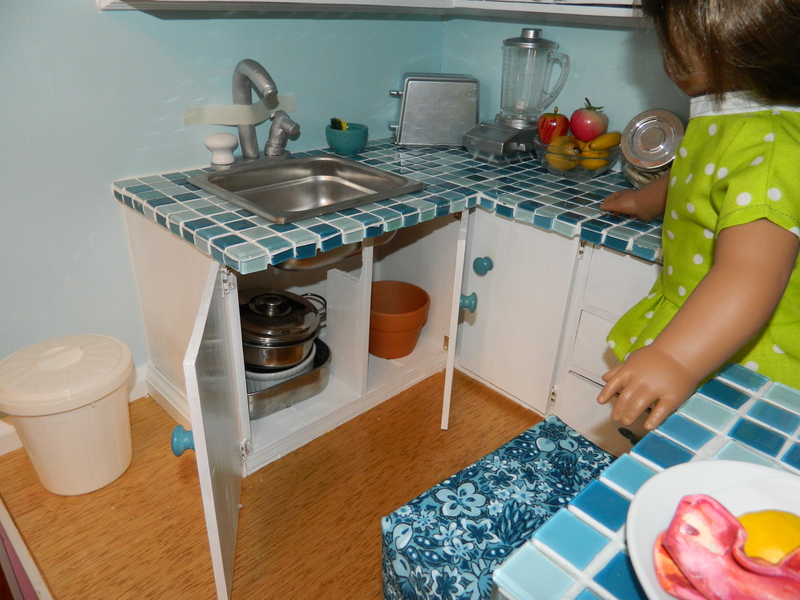 Pictures, posters, doll clothes, food, dishes, jewelry… all those things that will make this dollhouse your daughter’s own. 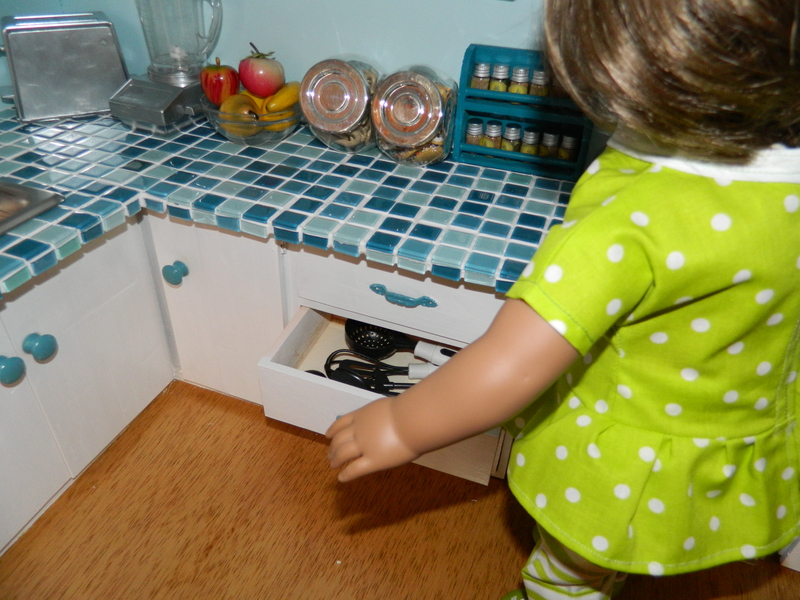 Dollhouse will be available for local pick up in Kansas City MO once payment is received. Feel free to email me with ANY questions. With regards to shipping: I want to work with you to make this your little girl’s perfect Christmas. I can deliver locally in and around Kansas City area for $50. That includes delivery and set up in your home. I will work with you on getting it to you, inquire about delivery outside the area, please send me an email. Of course you are always welcome to swing through town and pick it up! Please remember: The doll is not included. Everything else is. I would love to hear your comments, questions, your own experiences. See previous posts for more in depth instructions and photos. I’ve truly enjoyed this process, but am ready to move on to something new and challenging.